In last week’s blog we posted about a recent visit to our sister archive service in Glasgow, and this week we’ve turned the tables and it’s all about visitors to LHSA. Just as our trips to other archives have strengthened professional relationships and forged links between our related collections, we are keen to use these visits to us to help widen the Archive’s audience and help spread the word about the material we hold and the work that we do. November has been a busy month for visitors to LHSA. We have given tours to members of NHS Lothian staff, Edinburgh University students, potential volunteers, fellow professionals and a postgraduate student on the University of Glasgow Information Management and Preservation MSc course, who then went on to stay with us for a two-week work placement. (Sharon blogged about this on 9 November.) Sharon has been joined by seven other volunteers this month and, of course, we’ve had visitors to the CRC reading room to consult LHSA material for their research. Our visitors all came to find out more about LHSA – its collections and services – but some have also used the visit to draw on the experience of our archive and conservation-trained staff. If you would like to follow in their footsteps, please get in touch. While all our visitors have different reasons behind their interest in the Archive, most agree that the view from our office and the reading room (a perk of an in-person visit) is pretty spectacular! 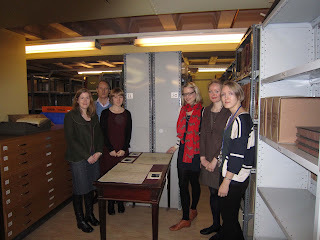 This week’s blog reports on a visit by LHSA staff to the NHS Greater Glasgow and Clyde Archives earlier this month. This was perhaps a meeting close in significance to Livingstone and Stanley (!) - between them these archives look after historical medical records for the cities of Glasgow and Edinburgh and their surrounding areas. The NHSGGC Archives' reading room facilities are in the Mitchell Library, as are their stores, and we were welcomed there by the Archivist, Alistair Tough, who introduced us to his two colleagues, Assistant Archivist, Emma, and a records trainee, Fiona. We were shown some gems from the Archive, including pioneering ultrasound scans and plans of the equipment which made them. Alistair explained that it is common to find olive oil on some of these records as this was put on the surface of the patients' skin to obtain better results. For more information about the NHSGGC Archives please see their website: http://www.archives.gla.ac.uk/gghb/. It was very interesting to visit this Archive as many famous medical people have worked both in Glasgow and Edinburgh during their careers, so there is much crossover between the records here and at LHSA. We look forward to hosting a return visit soon. Dott was born in Edinburgh in 1897 to art dealer Peter McOmish Dott and his wife, Rebecca, and was the third of five children. Norman showed considerable flair for design and engineering and was apprenticed to the local engineering firm of McTaggart Scott & Co after he left George Heriot’s School. However, a motorcycle accident in Lothian Road in 1913 (just outside what is now the HMV Picturehouse!) led to a leg injury and a spell in the Royal Infirmary of Edinburgh. Although the injury was to affect him for the rest of his life, Dott became fascinated by hospital life and entered the University of Edinburgh to study medicine, where he graduated M.D Ch.B. in 1919. Following impressive surgical appointments, teaching and research, Dott was awarded a Rockefeller Travelling Fellowship in 1923, spending a year with American neurosurgery pioneer Professor Harvey Williams Cushing (1869-1939) in Boston. In the same year (1923), he was made a Fellow of the Royal College of Surgeons of Edinburgh. The next stage in Dott’s career saw him become Honorary Surgeon at the Royal Hospital for Sick Children whilst at the same time working in private practice as a neurosurgeon. Dott used a nursing home in Edinburgh’s New Town for neurosurgery on private patients, to which he and his team had to transport their instruments by taxi or private car! Dott worked throughout his life for neurosurgery to be recognised and funded as a medical specialism in Scotland. Finally, 1938 saw the first patients enter Scotland’s first dedicated neurosurgical ward, the Department of Surgical Neurology in Ward 20 of the Royal Infirmary of Edinburgh, where Dott had been based since 1931. 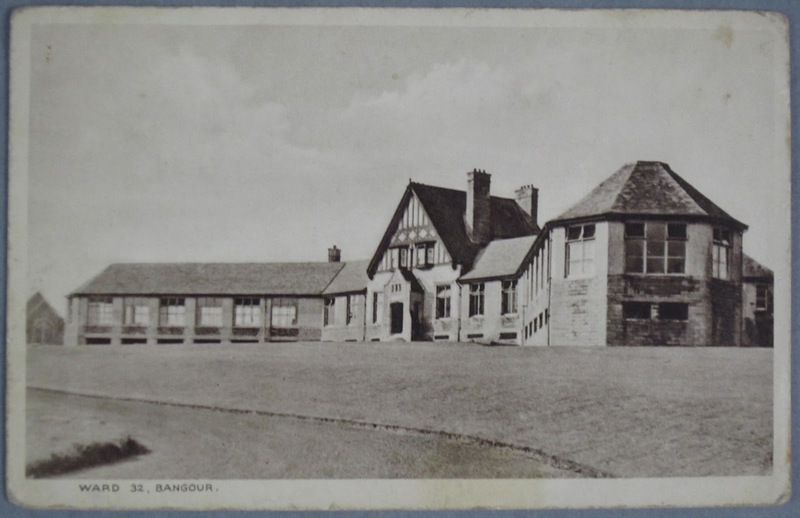 During the Second World War, Dott set up the Brain Injuries Unit in Bangour General Emergency Service Hospital in Broxburn, West Lothian. Working with two neurology teams to treat both civilian and service casualties, he was awarded a C.B.E for this work in 1948. Never giving up on his medical ambitions, Dott helped to establish the Department of Surgical Neurology at the Western General Hospital in 1960, taking a leading role in the design of operating theatres, notably including a reflector vaulted roof that avoided shadow falling on patient and surgeon. Dott spent only a brief time in the Western General before he retired in 1963. In the previous year, he was honoured as a Freeman of the City of Edinburgh and was made Emeritus Professor at the University of Edinburgh. He died in the city in December 1973 survived by his wife, Peggy, and only daughter, Jean. Norman Dott was one of medicine’s remarkable characters, remembered for his generosity towards his patients, worn mackintosh coat, and high expectations of junior medical colleagues as much as for his many clinical achievements and tireless commitment to his specialism. The case notes that Dott left behind record his impressions of triumphs (and failures) as he performed pioneering intracranial surgeries in the 1920s and 1930s, tell the wartime stories of the service men and women who were treated by the neurological teams at Bangour, and document the sheer variety and volume of conditions treated in Ward 20 of the Royal Infirmary of Edinburgh. As the research and development phase of our Norman Dott case note cataloguing project reaches its completion and cataloguing begins, these remarkable records are one step closer to becoming more accessible to researchers. This week’s blog is written by Sharon Boyle who has been with us on placement for the past two weeks. The collection she has worked on is fitting for Remembrance Sunday as it focuses on the work of Dr. Elsie Inglis who was instrumental in setting up the Scottish Women’s Hospitals for Foreign Service Committee. During World War One, the Committee sent teams to France, Serbia and Russia where all-female staffed hospitals treated the wounded. Dr. Inglis worked in Serbia until she was captured and sent home in 1915, only to return to mainland Europe as head of the Scottish Women's Hospital team in Russia from 1916 – 1917. Sharon shares some thoughts on the collection, and her placement. “I’ve spent the last two weeks working at LHSA on a placement. I’m currently eight weeks into the Information Management and Preservation course at Glasgow University; all students have do a cataloguing placement, and I thought that LHSA would be an interesting place to do mine. My task was to catalogue the papers of Dr. Anne McLeod Shepherd, an Edinburgh doctor. During her lifetime, she developed an interest in the work of Dr. Elsie Inglis. She established a maternity hospital for poor women, which would later become the Elsie Inglis Memorial Hospital, and then went to Serbia during World War One, to run and organise field hospitals. 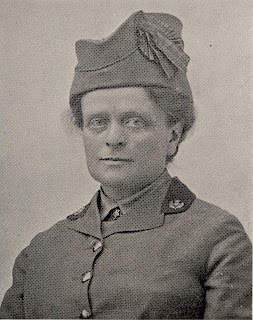 Dr. Shepherd’s interest in the life of Dr. Inglis was clearly reflected in her papers; she spent time campaigning to have the Elsie Inglis Memorial Hospital listed as a historical building, creating an Elsie Inglis Heritage Trail, and commissioning a plaque in her memory in Edinburgh’s High Street. I arrived with a reasonably clear of how to approach the task, having been prepared by lectures at university, but the practical work I’ve done over the last fortnight has really helped me to see how an archivist catalogues a collection. From the initial task of ‘box-listing’, making a note of what the collection contains , to making decisions about how to arrange the collection and recording that, to numbering the items in the collection and ‘re-housing’ them in suitable containers, has been extremely helpful for me. In my last few days I’m going to complete recording the details of the collection and finally make a note of any items I’m going to dispose of, e.g. duplicates and unannotated envelopes. Learning the cataloguing process has been interesting, but so has finding out about a part of history that I previously only knew a little about. The challenges faced by the early female medical graduates of the late 1800’s and early 1900’s and the personal sacrifices they made to serve in the War have been fascinating to discover. This week’s blog focuses on the Princess Margaret Rose Hospital (PMR). Originally named The Edinburgh Hospital for Crippled Children, this was the first specialist orthopaedic hospital in Scotland. 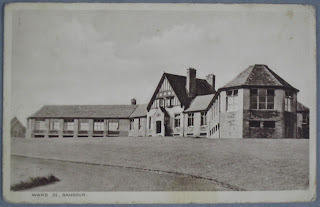 The foundation stone was laid in 1929 in Fairmilehead, and its first two wards were opened in 1932. By 1936, four wards were open, each containing 25 beds. In 1934, the name was first changed to Princess Margaret Rose Hospital for Crippled Children and by 1937 the word ‘crippled’ was dropped. In 1957 the name was changed to the Princess Margaret Rose Orthopaedic Hospital, as it was by then also used for treating adults. 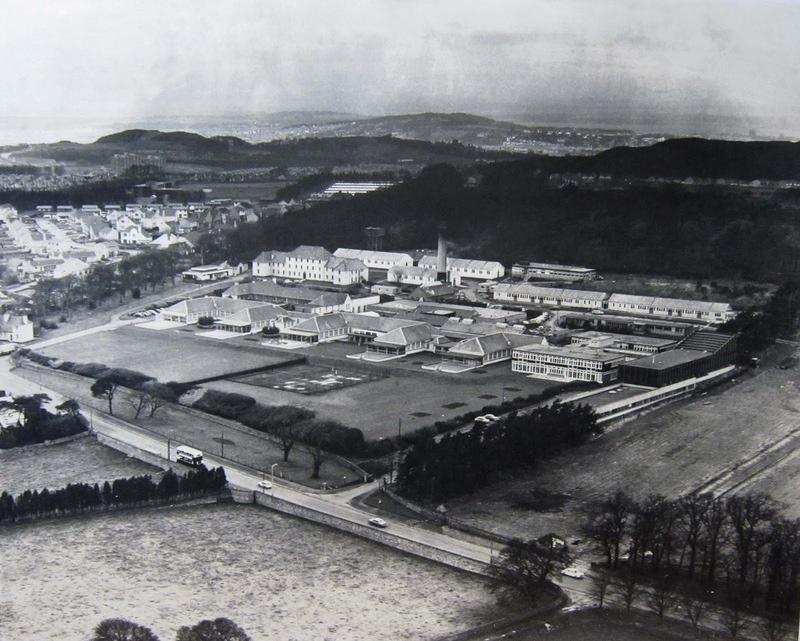 An aerial photograph of the Hospital, taken in 1973 (LHSA ref: PH5/85). 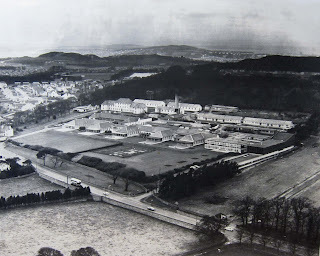 During the 1930s and 1940s, the main crippling diseases were tuberculosis and osteomyelitis (a bacterial infection of the bones), and the common treatment for these was to have the ends of the wards open to fresh air with frequent supplies of hot water bottles to keep patients warm and screens to keep the snow off the beds in winter. By the 1950s, instances of tuberculosis had been reduced by the efforts of public health campaigns and poliomyelitis (polio) became the main disease treated; the wards were closed off with glass screens. During the 1960s, polio was being successfully vaccinated against, however there was a rise in the number of children involved in road traffic accidents, requiring orthopaedic surgery at the hospital. Also in this decade, the use of the drug thalidomide during pregnancy resulted in cases of babies born with missing or malformed limbs, who benefitted from prosthetic limbs developed at the hospital. As can be seen from this brief history, the PMR changed its services and skills to meet the challenges of the different illnesses and injuries which affected children and adults during the 20th century. Special pre-registration training of nurses in orthopaedics was also provided at the hospital from 1941 until 1978. The hospital finally closed in 2002, when its patients were transferred to the newly opened Royal Infirmary of Edinburgh at Little France. LHSA’s PMR records include annual reports, administration papers and patient records. Special mention should be made of the 10,553 X-rays which have been digitised from the case notes.